Detroit Speed performance parts, exterior accessories, and apparel are made proudly in the USA and provide many solutions to your automotive needs. Summit Racing offers a large selection of Detroit Speed automotive parts including leaf springs, lowering springs, sway bars, conversion kits, and other chassis and suspension components. Summit Racing also carries a variety of Detroit Speed clothing options, including T-shirts, sweatshirts, hoodies and hats. 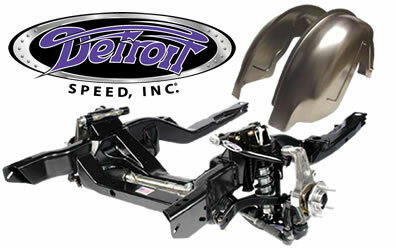 Find all of the Detroit Speed performance parts and apparel you need, right now, at Summit Racing.